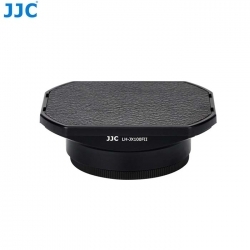 JJC LH-JX100FII dedicated Lens Hood is designed to prevent unwanted stray light from entering the lens by extending and shading the end of the lens. This lens hood is made of premium aluminium alloy, which is sturdy and durable. The non-glare matte finish on the inside further prevents or limits lens flare. No vignetting will show with the hood on. With the extended lens end, you will also benefit from extra protection from accidental impact. The lens hood is equipped with a cap for better protection of your lens. The hood also allows you to put on a Ф49mm filter and a Ф49mm lens cap. The whole lens hood maintains the aesthetic of the lens and camera system. JJC LH-JX100FII replaces Fujifilm LH-X100 Lens Hood & AR-X100 Adapter Ring, and fits Fujifilm X70/X100/X100S/X100T/X100F cameras.